Coos County Logging Museum in Myrtle Point. Coos County was at one time one of the most productive timber-growing environments in the world as the area offered vast stands of old growth Douglas fir, cedar, spruce, and hemlock. In the early 1850s, Euro-Americans visiting the Coos Bay area were impressed by the abundant forests and decided to capitalize on the growing demand for lumber products in California. These newcomers noted that the region contained the best timber in Oregon and compared the Coos Bay harbor as a close second only to San Francisco as a commercial depot. Its relative isolation from the rest of the state’s areas with the most commerce and largest populations allowed for Coos Bay to be tied to San Francisco both culturally and financially. Investment in mining and lumber operations was so prominent at this time that capitalists from San Francisco and elsewhere controlled the entire southern Oregon coast economy by 1875. Investors from the Great Lakes region also sought to profit from the area’s natural bounty in the early 1900s. As logging technology continued to revolutionize, the Southern Pacific Railroad announced its plan to construct a connection to Coos Bay and ownership of lumber mills and thousands of acres of timberland began to concentrate into a few large holdings, such as the Smith, Weyerhaeuser, and Menasha timberlands. This is only a brief snapshot into the complex, multi-faceted history of Coos Bay’s timber industry and an extremely abridged account of the many diverse stakeholders involved. To learn more, visit the Coos County Logging Museum located in Myrtle Point. This museum is listed with the National Register of Historic Places and serves as a celebration logging industry’s rich history. Here, you will find a plethora of photographs, records, and authentic logging tools that have been preserved over the years. The museum also displays a collection of nine large hand-carved myrtlewood panels by the renowned woodcarver Alexander Benjamin Warnock. These beautiful pieces capture the ‘glory days of the timber industry’ and are a symbolic representation of the era that so intricately shaped Coos Bay and the surrounding areas. The American crow, the more you know about them the more interesting they are. Crows are a large, intelligent, all-black bird with a hoarse, cawing voice that is familiar over much the continent. They are common sights in treetops, fields, and roadsides, and in habitats ranging from open woods and empty beaches to town centers. They usually feed on the ground and eat almost anything, including earthworms, insects and other small animals, seeds, and fruit as well as garbage and chicks they rob from nests. American crows are very social, sometimes forming flocks in the thousands. In the winter, American crows congregate in larger numbers to sleep in communal roosts. These roosts can consist of a few hundred up to two million crows. Some roosts have been forming in the same general area for well over 100 years. These birds also have a reputation for being inquisitive, somewhat mischievous and good learners and problem-solvers. American crows are also known to work together to harass or drive off predators, a behavior known as mobbing. This interesting video features a crow solving 8 puzzles in a row in order to reach food. What do think of when you say the word Newt? … maybe you thought they were just a mythical made up creature! Well in fact the Oregon coast is home to this very interesting creature the Rough Skinned Newt! Rough-skinned newts were named for their dry granular skin―most other salamander species have moist smooth skin. 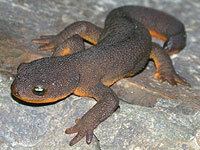 A terrestrial adult newt has a brown head and back with a bright orange belly and can grow to almost eight inches in total length. Through the non-breeding season, terrestrial adults live in forested areas along the coast and through to the eastern foothills of the Cascades. They find protection in or under soft logs. For their size, these newts travel relatively long distances between their breeding and non-breeding habitat and may be seen crossing sidewalks and roads during spring and fall as they migrate. An interesting study from Standford University reveals Rough-skinned newts harbor in their skin the same deadly toxin found in blowfish. A newt must be ingested to be toxic but Garter snakes that dine on the newts have evolved resistance to the toxin, spurring greater toxicity in the newts by natural selection. But now researchers report that in some areas, the snakes have somehow evolved levels of resistance far beyond what the newts are capable of countering. The newt emits an acrid smell that probably discourages most predators from tasting it.